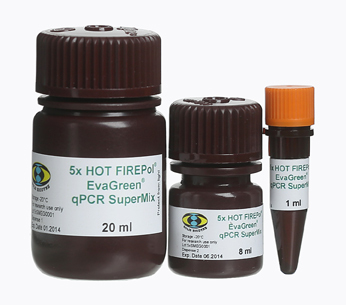 HOT FIREPol® EvaGreen® qPCR Supermix is an optimised ready-to-use solution for real-time quantitative PCR assays, including EvaGreen® dye. It comprises all the components necessary to perform qPCR excluding the template and primers, to perform highly sensitive qPCR. HOT FIREPol®DNA Polymerase is activated by a 12 min incubation step at 95°C. Hot-start mechanism prevents extension of non-specifically annealed primers and primer-dimers formed at low temperatures during qPCR setup. 08-36-00001 1 ml 5x PDF PDF PDF 47 EUR Login to buy! 08-36-00008 8 ml 5x PDF PDF PDF 360 EUR Login to buy! 08-36-00020 20 ml 5x PDF PDF PDF 820 EUR Login to buy! EvaGreen® is a DNA-binding dye with many features that make it a superior alternative to SYBR® Green I for qPCR. Apart from having similar spectra, EvaGreen® has three important features that set it apart from SYBR® Green I: EvaGreen® has much less PCR inhibition, is extremely stable dye and has been shown to be nonmutagenic and noncytotoxic. EvaGreen® is compatible with all common real-time PCR cyclers – simply select the standard settings for SYBR® Green or FAM! ROX is an internal passive reference dye used to normalize the fluorescent reporter signal generated in qPCR. Shipping and temporary storage for up to 1 month at room temperature has no detrimental effects on the quality of HOT FIREPol® EvaGreen® qPCR Supermix. EvaGreen® is a registered trademark of BIOTIUM, INC. This product is provided under an agreement between BIOTIUM, INC. and SBD and the manufacture, use, sale or import of this product is subject to one or more of pending patent applications owned by BIOTIUM and ALLELOGIC. The purchase of this product conveys to the buyer the non-transferable right to use the purchased amount of the product and components of the product in research conducted by the buyer, where such research does not include testing, analysis or screening services for any third party in return for compensation on a per test basis. The buyer cannot sell or otherwise transfer (a) this product (b) its components or (c) materials made using this product or its components to a third party or otherwise use this product or its components or materials made using this product or its components for Commercial Purposes. Commercial Purposes means any activity by a party for consideration and may include, but is not limited to: (1) use of the product or its components in manufacturing; (2) use of the product or its components to provide a service, information, or data; (3) use of the product or its components for therapeutic, diagnostic or prophylactic purposes; or (4) resale of the product or its components, whether or not such product or its components are resold for use in research. For information on purchasing a license to this product for purposes other than research, contact BIOTIUM, INC., Business Development, 3423 Investment Blvd, Suite 8, Hayward, CA 94545 Tel: 510-265-1027, Fax: 510-265-1352. FIREPol is a trademark of Solis BioDyne. Applied Biosystems and StepOne are trademarks of Applied Biosystems LLC. QuantStudio and ViiA are trademarks of Life Technologies Corporation. Stratagene, M30005, MX3005P are trademarks of Agilent Technologies inc. Mastercycler is a trademark of Eppendorf AG. Rotor-Gene is a trademark of Qiagen GmbH. CFX96, CFX384, iQ, MyiQ, Opticon 2, Cromo4, MiniOpticon are trademarks of Bio-Rad Laboratories. LightCycler is a trademark of Roche Diagnostics GMBH. The Eco is a trademark of Illumina Inc. EvaGreen is a trademark of Biotium Inc. SYBR® is a registered trademark of Molecular Probes, Inc.
contact technical support via skype: support.sbd. All inquiries will be responded within 24 hours at most.